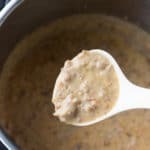 This Instant Pot Sausage Gravy recipe is easy and delicious. Serve it over homemade or canned biscuits for the ultimate breakfast. I love using my Instant Pot Pressure Cooker to make breakfast in the mornings. I keep oatmeal, cornmeal poridge, Instant Pot egg bites, grits, and this breaksfast sausage on regular rotation. 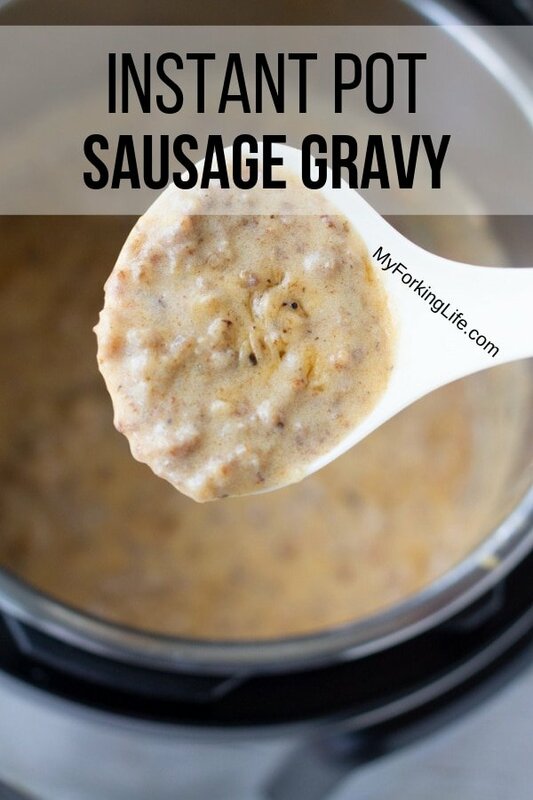 I used to make my sausage gravy on my stove top but it’s so much easier to make in the Instant Pot, so why not. The great thing is after it’s done cooking, the Instant Pot will keep it warm for you. This makes it the perfect breakfast idea for those weekend morning breakfast. 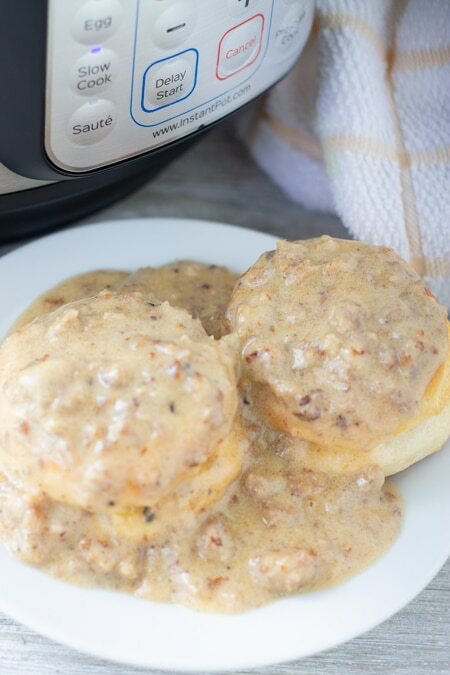 You can serve this Instant Pot Sausage Gravy with homemade biscuits or canned biscuits. I won’t lie…depending on my mood, I will sometimes just throw some Pilsburys in the oven. If you can do homemade though…do it. First, you will want to set your Instant Pot on sauté and brown your pork sausage. I use plain pork sausage but you could experiment with the different flavors if you like. Once your meat is brown, you will add your butter and stir until the butter has melted in. Added fat is good for this recipe. Then you’ll sprinkle your flour over the meat and stir for about 1 minute. Then add in your maple syrup, milk, salt, and black pepper, and stir, ensuring that there are no brown bits stuck to the bottom. 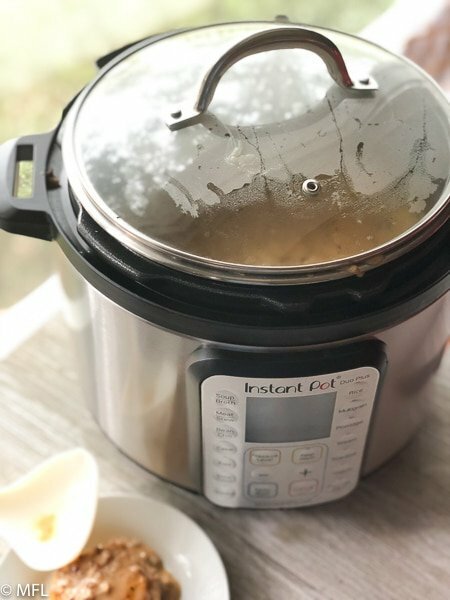 Turn off your Instant Pot and then set it to low pressure, cook time of 2 minutes. Cover and walk away. Once timer goes off, do a quick release and open. Your gravy will look watery but stir and it will thicken up. If you want it even thicker, select medium sauté and cook and stir until desire thickness is reached. 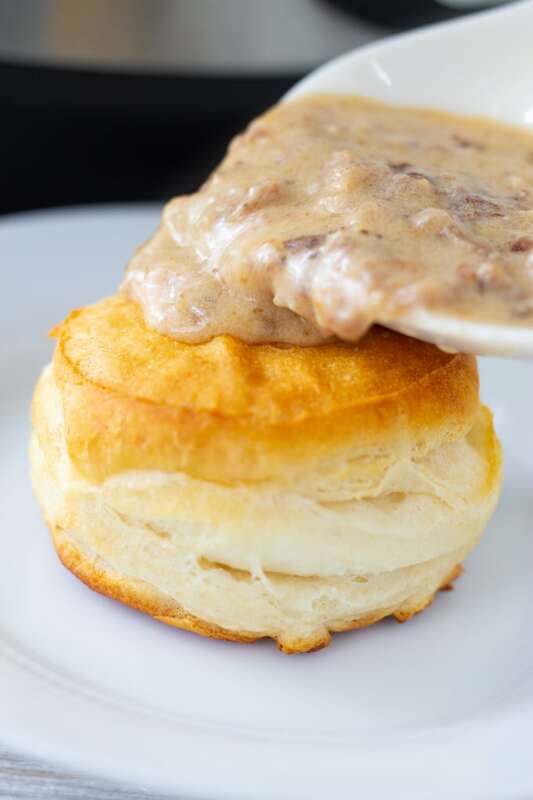 Serve this sausage gravy over fluffy oven baked biscuits that have been broken in half. Or eat it by the spoonful…which is what I do from time to time. If you are looking for biscuit tips, you can check out my post on what I learned making Bojangles biscuits. The tips and tricks are great. I like to keep my gravy warm by turning on the slow cooker function in my IP rather than the keep warm function. I set it to slow cook on medium and cover it with my Instant Pot glass lid. That way my family can go for seconds and thirds without worrying that the gravy is cold. 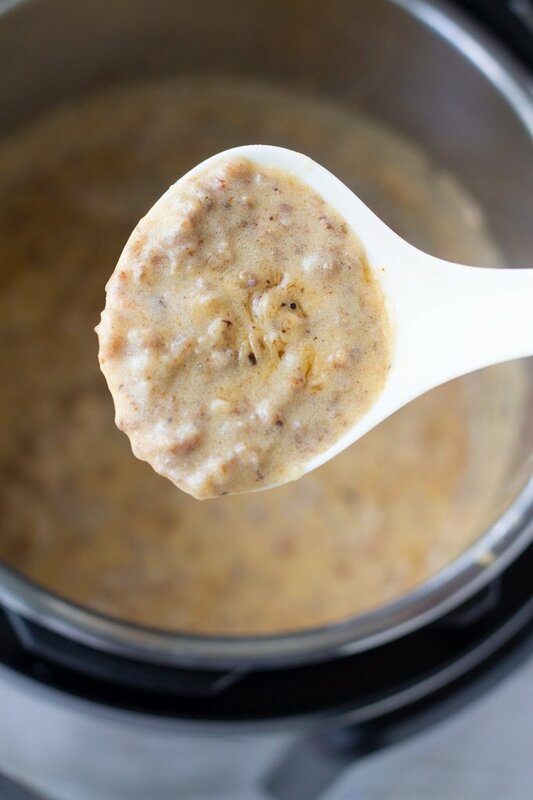 Delicious Instant Pot Sausage Gravy to serve over your favorite fluffy bizcuits. Set Instant Pot to Sauté and select “More” setting. Once Instant Pot displays “HOT” add your sausage. 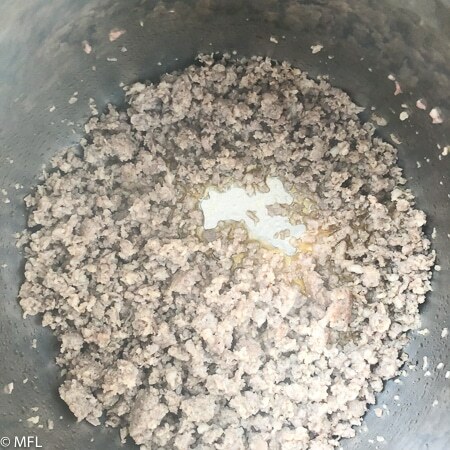 Stir and brown sausage until it is no longer pink, about 5 minutes. Add butter and stir until butter is melted. Sprinkle flour over meat and stir. Cook for about one minute while stirring. Add milk, maple syrup, salt and black pepper. Stir, ensuring that there are no brown bits stuck to the bottom. Once timer goes off, do a quick release by turning the Valve to “Venting.” Once all the pressure is released, open the lid and stir the gravy. The gravy will thicken upon stirring. If you would like the gravy thicker, select Sauté and put it on the normal setting. Cook, while stirring, until desired thickness is reached. This recipe was made in a 6 Qt Instant Pot DUO. 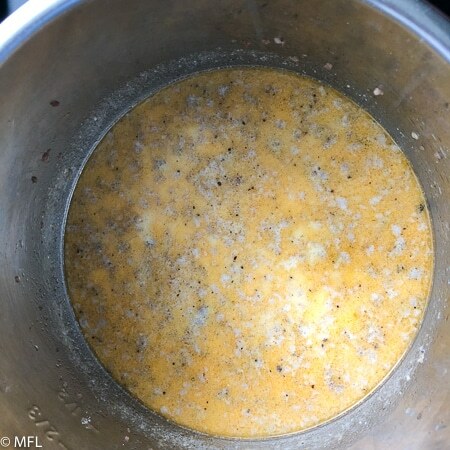 for about 10-15 minutes or until gravy has thickened to desired consistency. This is great to keep warm in the Instant Pot while having breakfast. 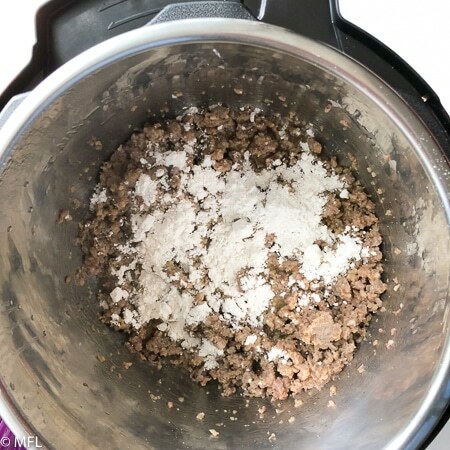 Brown ground pork in the Instant Pot on the Sauté function. Add butter and stir until melted. Sprinkle all purpose flour over the mixture and stir while cooking for about one minute. Pour milk into Instant Pot. Turn off Sauté function and cook on low pressure for 2 minutes. Sauce will thicken once done. You could also select sauté and cook until it has thickened a bit. Pour Instant Pot gravy over fresh or canned biscuits. I tired this today and got the dreaded “BURN” message 🙂 I thought I deglazed well enough. I emptied the inner pot cleaned it out put the food back in and I got the burn again. Any ideas??? 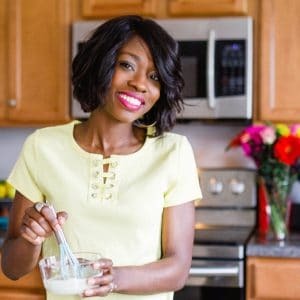 Which brand Instant Pot are you using? I’ve made this in the LUX and DUO and haven’t gotten a burn. However, I do think that newer models or 8qt models will give off a burn signal even if the food isn’t technically burning. Releasing the pressure and opening to stir or waiting until the burn dissapears should work. Super easy to make and very yummy. For us, it was a bit too much salt, but that is an easy fix. Thanks Trina 🙂 The salt may need to be adjusted depending on the kind of sausage you use as well. SO excited to try this recipe. I’m a huge biscuits and gravy fan! Was wondering if you’ve ever doubled the recipe? Wanting to make it for a bigger crowd this weekend, so I was wondering if you knew how well it did doubled? Hi Mackenzie, I haven’t doubled this recipe but it should work just fine. I LUV U!! Every Christmas morning I make a HUGHHHHH batch of SG for brkfst! 17 mins!!! SANTA HAS ARRIVED!! I will do a test run before the big day & I’ll report back. Sliced bread was NOT this AMAZING!!! Only gave a 4☆☆☆☆ for now until I have made thus AMAZING find! This was absolutely delicious!!! I used just 1 heaping tsp of salt vs 2 and followed everything else to a T with some organic ground pork – this is a keeper! Served it over rolls and scrambled eggs on top! yummy, I love how you added scrambled eggs to the mix. 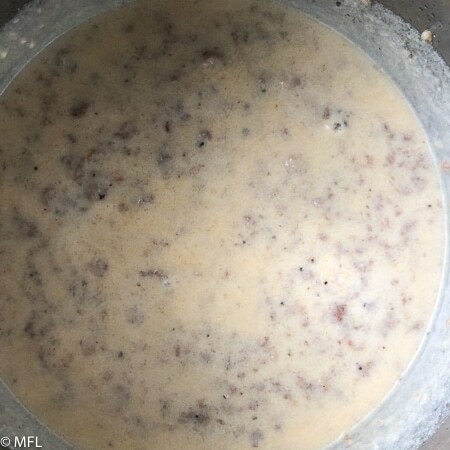 I have eaten sausage gravy all my life, but, never made it with maple syrup. Does it have a sweet flavor instead of savory? I am looking forward to making sausage gravy in the IP. Hi Robin, it has a hint of sweetness, but nothing overpowering. Feel free to cut the maple syrup down to half a tablespoon to see if you like it at first. My family loves gravies and we think the IP makes the best ever gravies! Thanks for this recipe, I will be trying it soon. It sounds very much like our traditional stop recipe.